this could be the visa for you! The Australian Government has introduced a special Skilled Visa (subclass 476) which is intended to combat the shortage of skills in the field of Engineering experienced by Australian employers. This visa allows recent graduates of selected overseas universities to gain up to 18 months of skilled work experience in occupations in demand in Australia. As a holder of this visa, you may apply for permanent residence at any time, as long as you meet the eligibility requirements, including the pass mark on the Points Test, or are sponsored by an employer. There are no conditions placed on this visa. 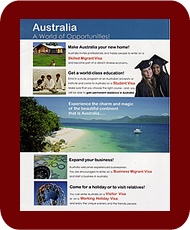 If you are granted this visa, you are able to live and work in any part of Australia and engage in any type of employment. in the last two years. Any institution offering an Engineering qualification accredited under the Washington Accord is a recognised institution. The Washington Accord is an international agreement among bodies responsible for accrediting engineering degree programmes. It recognises the substantial equivalency of programmes accredited by those bodies and recommends that graduates of programmes accredited by any of the signatory bodies be recognised by the other bodies as having met the academic requirements for entry to the practice of engineering.